Larter & Sons grape vine cufflinks, circa 1900. I have been enjoying a short, sporadic vacation recently, so this note may be a little disorganized and uncharacteristically brief. One of the areas neglected during my absence (besides blog posting) has been the garden. Despite the neglect, it has been a glorious season for the flowers with the Full Moon Coreopsis in full bloom and the Ruby Dwarf Helenium coming into its own. With the garden on my mind it is appropriate to post several pairs of antique cufflinks featuring flowers and plants. 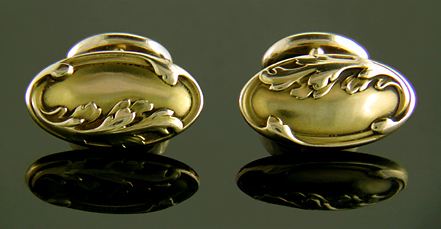 Chrysanthemum and vine cufflinks, circa 1910. A riot of wild chrysanthemums flourishes across these eight-sided cufflinks, a scene that recalls the Japanese woodcuts of the 1800s. The influence of Japanese art on Art Nouveau design can be seen in the flowing tendrils and vines that curl like wind-blown wisps of smoke between the flowers. Within the small area of the cufflinks (less than 5/8" across) I count eight blossoms in various stages of bloom. Created by United Jewelers in 14kt gold, circa 1910. Carrington rose and thistle cufflinks, circa 1920. Carrington cufflinks with elegant rose and thistle borders. A client suggested that the rose-and-thistle motif may be a subtle celebration of Scottish-English unity, but I am inclined to believe that the design was chosen more for its beauty than any political allusion. Initially, I described the centers of these cufflinks as radiant sunbursts. Now that I am in a floral frame of mind the centers appear more like dramatic flowers evocative of the stylized lotus blossoms and papyrus fronds of the Pharaohs or ancient India. Perhaps a reader with greater knowledge of the flora and iconography of the ancient world can shed some light. These eclectic cufflinks were crafted by Carrington & Company in 14kt gold, circa 1920. Larter & Sons 14kt gold acanthus leaf cufflinks, circa 1900. In the early 1900s, the Newark-based jewelry firm, Larter & Sons, created a wonderful collection Art Nouveau inspired cufflinks. The entwining grape vine cufflinks at the top of this post are a nice example. The acanthus leaf cufflinks pictured here further illustrate the firm's ability to create dramatic cufflinks with flowing, organic designs. The acanthus leaves appear to be slowly encroaching across the gently domed surface of the cufflinks. Created by Larter & Sons in 14kt gold, circa 1900. Larter & Sons acanthus leaf cufflink, circa 1900. Recent additions to the Antique Cufflink Gallery feature three striking Art Deco dress sets and an elegant pair of Larter cufflinks with flowing acanthus leaves. Acanthus Leaf! 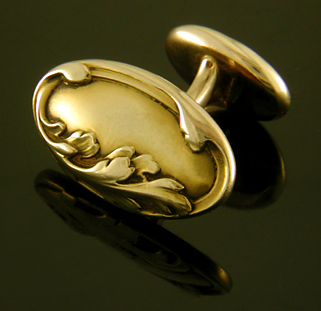 Dramatic gold cufflinks with flowing acanthus leaves. A nice example of the flowing, natural curves favored in Art Nouveau design. Crafted by Larter & Sons in 14kt gold, circa 1900. Art Moderne! A striking full dress set with the elegant lines and geometry of the late Art Deco period. Crafted in platinum and 14kt gold, circa 1930. Platinum & Onyx! An elegant black onyx full dress set with small white pearls. The interplay of black and white is accentuated by brilliant platinum borders. Crafted in platinum and 14kt gold, circa 1925. Platinum & Pearl! A dramatic Art Deco full dress set that beautifully captures the elegance and sophistication of the era. Crafted in platinum and 14kt gold, circa 1925.